These last few months I've had a really busy schedule. Typically this means weeks of takeout and unhealthy eating. Thankfully, all of my digressions haven't resulted in extra weight gain. But, it has taken a toll in a different way. I feel like there's something missing on the inside. Like the food is taking care of hunger but not much else. Typically, I reserve healthy eating for when the pounds start to accumulate but I realize that eating healthy has benefits beyond what's on the surface. Sometimes we just need a reminder of all the reasons why eating a ton of fruits and veggies is a winning strategy for summer. Summer is the time of indulgent eating. Between weekend brunches, dinners after work and snacking while watching our favorite shows, the unhealthy eating really ads up. Even if you have a high metabolism, that still shouldn't be a reason to avoid healthy foods altogether. There are so many benefits of adding more plant-based foods in your diet here's a short list of why greens should be part of our daily diet. I'll start with the most obvious. Enjoying lots of salads and veggies will likely result in a slimmer waistline. Eating a bunch of carb rich foods is like feeding your waistline. When I recall all the times I've sported an effortlessly flat tummy, one of those instances was when I gave up gluten and replaced bread with leafy greens. For example, instead of ordering a sandwich as Subways, I'd order the protein over a bed of greens. My initial motivation for going gluten-free was to test if a gluten sensitivity was the cause of my stubborn cystic acne. One of the first changes I encountered was a sudden loss of weight. More specifically, weight around my midsection. I've already experienced this wonderful outcome when I enjoyed pre-made salads every day. It's time to bring this habit back. Flat tummy aside, I want to eat nutrient-rich foods to take advantage of hair growth season. We've already discovered that spring and summer are considered "hair growth season." Why? Because in warm weather, blood flows more to the surface of the skin. This increased circulation could be beneficial to our hair journey if we play our cards right. Remember when we talked about the link between working out and hair growth? I believe that we can still take advantage of enhanced hair growth if we eat well during this time of year. Our internal circulation is greater so why not make sure that your skin & scalp become the recipients of nutrient-rich blood flow. Working out + eating healthy only enhances this outcome but perhaps we can still benefit by just improving our eating choices. The next reason why I'm making new eating choices is because I want to eat in a way that raises my vibration. Years ago I watched one of those Netflix health documentaries and one of the points they made really stuck with me. If I remember correctly, they looked at different foods under an electronic microscope and they found that organic foods and vegetables seemed to emit a higher level of energy than their counterparts (non-organic fruits/veggies). One could only imagine how these organic foods compared to processed packaged options. These foods are essentially lifeless but they do address hunger and they do taste good, so we keep going back. Ever since my feel good manifestation experiment, I've been fully convinced of the power of managing how I feel at all times. I want to attract more into my life. Feeling good on the inside and out is part of that. Salads may not taste as good as hot, fresh fries, but they certainly make me feel better. If all of this wasn't enough to convince you, I should also mention that eating healthy is considered a keystone habit. These are the habits that lead to other supportive habits. For instance, the more fruits veggies I eat, the less tired I feel. The less tired I feel, the more I'm motivated to go for a walk, organize my home or take on a task that I've been putting off. Sometimes, a small simple action serves as the trigger we need to accomplish bigger things. I haven't even touched on the importance of consuming fruits/veggies for their micronutrient content. Just know that your internal systems (cells & organs) rely heavily on your consumption of fruits and veggies for proper functioning. 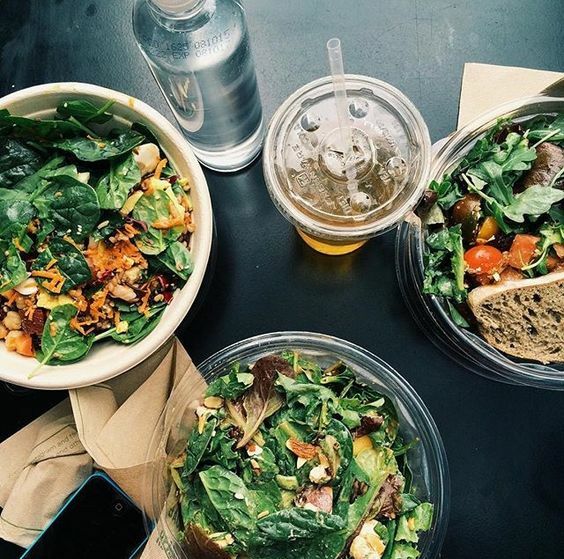 This is probably the most important reason to load up on superfood salads. The #saladsallsummer mantra isn't necessarily a call to only eat salads. You can still eat your favorites. I'm just saying that we consider following the guideline of eating multiple servings of fruits and veggies a day. Don't go a day without eating/drinking something green. Who knows where that will lead. Weeks from now, when your skin is glowing, your tummy is flatter, and your energy is sky high. Future you will extremely be grateful. yep, we currently implemented this strategy in our house - salads with protein for dinner every night, on exception on the weekend only. My husband is losing weigh and feeling healthier, and I am too. Plus i love that we are getting in our veggie and fruit content! great post.